Jo Johnson has been appointed the Minister of State for Universities and Science at the Department for Business, David Cameron has announced today. He was reelected the Member of Parliament for Orpington last week. He joins the new look Conservative Party cabinet. He is the youngest of four children and is younger brother of Boris is Mayor of London; mother is a journalist and writer. Although a Londoner by birth, he started school in Brussels and later moved to Eaton College, thereafter attending Balliol College, Oxford where he achieved a first class degree in Modern History. He is also a fluent french speaker. 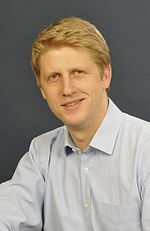 Jo Johnson wrote a book on “Reconnecting India and Britain: Ideas for an enhanced partnership”, where the UK explored the scope for a new relationship. A truly global thinker, Jo Johnson was previously the Downing Street Policy Unit and was appointed Minister of State on 15 July 2014 and should exceed in this new role in the Department of Business.